Although dragonkind has peacefully maintained special friendships with various animals and beastfolk in modern times, those relationships have frayed into rivalries*. Once staunch allies, familiars everywhere are rising up to lay claim to lairs and dens all across Sornieth. Beastly buddies? More like beastly baddies! 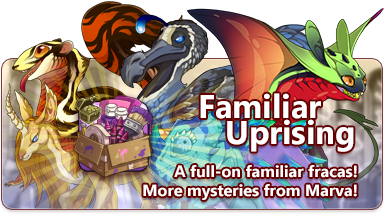 For the remainder of April 1st (until 23:59 server time), dragons and their paired familiars will swap places**. I'm ASCENDING, this might just be my favorite one. And the banner too! I for one welcome our new Familiar overlords! I'm looking forward to opening Marva's gift!